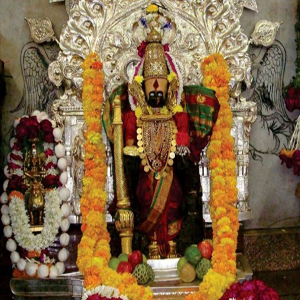 The Shri Mahalaxmi Temple of Kolhapur in Maharashtra, India, is one of the Shakti Peethas also called Dakshin Kashi, listed in various puranas of Hinduism. According to these writings, a shakti peetha is a place associated with Shakti, the goddess of power. The Kolhapur peetha is of special religious significance, being one of the six places where it is believed one can either obtain salvation from desires or have them fulfilled. The temple takes its name from Mahalakshmi, the consort of Vishnu, and it is believed that the divine couple reside in the area. The crown contains an image of the Sheshnag â€” the serpent of Vishnu. In Her four hands, the deity of Mahalakshmi holds objects of symbolic value. The lower right hand holds a mhalunga (a citrus fruit), in the upper right, a large mace (kaumodaki) with its head touching the ground, in the upper left a shield (khetaka), and in the lower left, a bowl (panpatra). 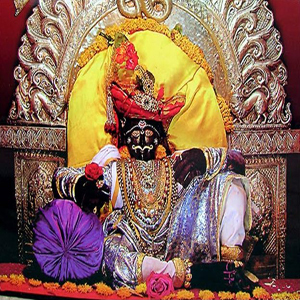 Shree Jotiba is a holy site of Hinduism near Wadi Ratnagiri, Maharashtra, India. The deity of the temple is known by the same name, and is held by the locals to be an incarnation of three gods: Brahma, Vishnu, Mahesha, and Jamadagni. An annual fair takes place on the full moon night of the Hindu months of Chaitra and Vaishakha. Shree Jotiba temple is an important Hindu religious destination located at an altitude of 3124 feet above sea level in the Panhala range of Maharashstra. It is believed that the main deity the Shree Jotiba is formed from the souls of three Primary Gods, Brahma, Vishnu and Shiva. Legendery stories tell that Jyotiba is formed to kill the demon Ratnasur. This temple is one of the 12 Jyotirlingas. This is also called Kedarnath and Wadi Ratnagiri. Mythology says, Jotiba helped Mahalaxmi in her fight with the demons. He founded his kingdom on this mountain. He belongs to the Nath cult. He was born in the hands of Vimalmbuja, the wife of the sage Pougand, on Chaitra Shukla 6. Rankala is famous place to visit in Kolhapur. 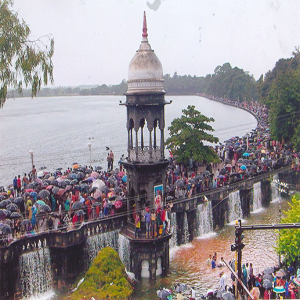 This lake was constructed by Chhatrapatis of Kolhapur. It is said that its deep area was get created due to quarries of stones which were used for construction of Mahalaxmi temple. There is temple of Rank Bhairav at the center of the lake. The name rankala to the lake is also derived from this god. The lake area is very large. There are differant types of birds around. One can see many lotuses in the lake. There is 'Choupati' around the lake. The 'Choupati' is beautified by Gardens. There are several coconut trees in ' Shalini Palace' garden. At 'Choupati' you can get all kinds of 'chatts' and Ice creams. The 'Vada Pav' over here is famous in Kolhapur. In garden there are some special amenities available for children to play . It is nice place to stroll in the evening. Jotiba temple and Panhala fort are easily visible from here which gives panoramic view. One should not miss sunset view from this place. 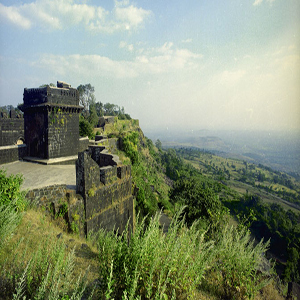 Panhala or Panhalgarh, about 19kms north-west of Kolhapur, is possibly the largest and most important fort of the Deccan. Roughly triangular in shape, the hill fort stands at a height of about 850 metres and has a circumference of approximately 7.25kms. Half of its length is protected by a natural scarp reinforced by a parapet wall and the remaining half is surrounded by a strong stone wall strengthened with bastions. The fort had three magnificent double walled gates, out of which two have survived. The Teen Darwaza to the west is an imposing and powerful structure. There are a number of ruined monuments in the fort. Panhala was the capital of the Shilahara king Bhoja II during 1178-1209 Ad. It was successively held by the Yadava and Bahamani Kings. In 1489 AD, the fort and the territory was taken over by the Adil Shahi dynasty of Bijapur.